Today's objective was to analyze the samples synthesized on February 9 and to make more fiber samples to be analyzed next week. However, our objective was not exactly met. We found numerous errors with our synthesis and analysis, so we spent today trying to improve our techniques for next week. We also collected fluorescence measurements of our samples from February 9. Finally, we made a more concentrated stock of acetylsalicylic acid so that the volume of acetylsalicylic acid we would need to add to our samples would be negligible. We used an excitation wavelength of 280nm. We used 200µL of each sample and blank to take a fluorescence measurement. Between each sample or blank, we cleaned out the cuvette with HCl, DI water, and methanol. We did the math wrong for our samples synthesized yesterday. By adding an extra 198.02µL of DI water to our samples to keep the volume constant, the final concentration of acetylsalicylic acid would actually be just slightly less than 200, 100, or 50µM. However, we forgot to actually add the water or acetylsalicylic acid after taking the samples out of the oven before we took fluorescence and UV-Vis measurements. As a result, our "after" samples did not contain any acetylsalicylic acid, and our "before" samples actually would have a concentration of either 200, 100, or 50µM acetylsalicylic acid. Unfortunately, between 200-500µL of water evaporated from the samples on average while they were in the oven. As a result, the concentration of lysozyme AuNP, and acetylsalicylic acid in the samples were no longer precise and varied between samples. After discussing all of these errors, we decided to continue taking fluorescence and UV-Vis measurements of all of the samples anyway. The data would most likely be irrelevant, since our synthesis did not proceed correctly and our fluorescence measurements were too high to be useful in determining concentrations of acetylsalicylic acid. However, we still wanted to collect data before discarding the samples. 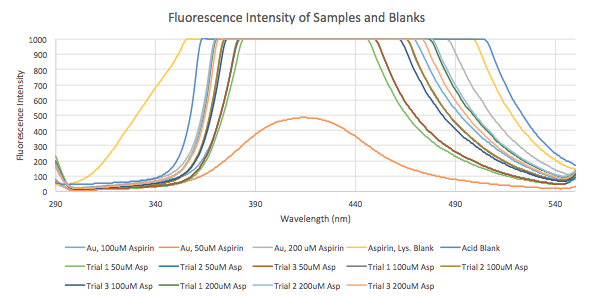 The above figure shows the fluorescence intensity of each of the samples and blanks as a function of the wavelength light at which they fluoresce. Since the samples were done in triplicate, their fluorescence intensities were averaged. The legend shows which line on the plot corresponds to which sample or blank. This page was last edited on 27 September 2017, at 01:36.